President Barack Obama continued a three-month upward swing in the polls in January, with his average job approval rating for the month ticking up 1.2 points, and his disapproval rate falling by exactly the same amount. January started off on a relative high note, after Obama won a staredown contest with the Republicans in Congress over a tax break. He was helped out as well by the release of the December unemployment figure, which continued moving down to 8.5 percent. Obama then boldly made some recess appointments which the general public barely noticed, but which went over in a big way with the politically-aware Democratic base. There was a lull in the middle of the month as the Republican nominating contest dominated the airwaves, but Obama got the chance to close out the month in a big way with his annual State Of The Union speech. This was all reflected in his polling numbers. Barack Obama entered January fairly strong (compared to the previous month), fell back a bit toward the middle of the month, and then closed out almost as strong as he started the month. On the fourth of the month, Obama hit a milestone he hasn't achieved since last July -- his approval and disapproval daily average numbers exactly matched, at 47.6 percent. This would be the high point for his approval number for the entire month, however. Within a week, Obama's numbers had swung to a one-day low (likely a statistical anomaly) of 44.5 percent approval to 50.3 percent disapproval. 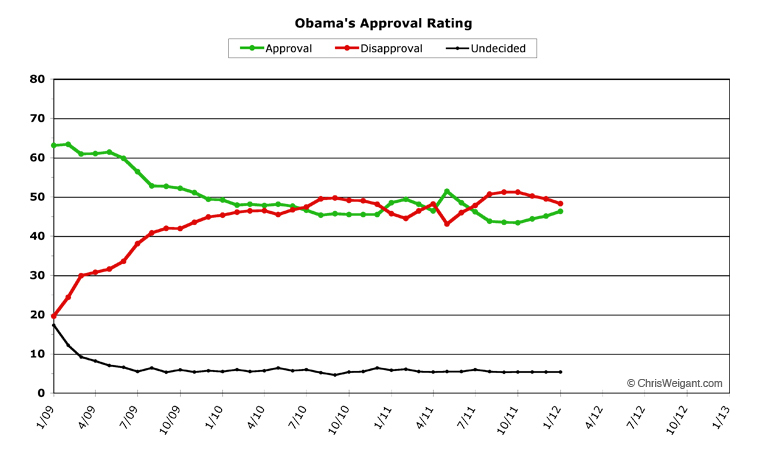 While this one-day blip quickly rose by roughly a point, Obama spent the next week or so in a low phase. Towards the end of the month, however, his daily numbers were climbing once again and finished up at 47.0 percent approval and 47.5 percent disapproval. Which all adds up to a monthly average approval number for Barack Obama in January of 46.3 percent. 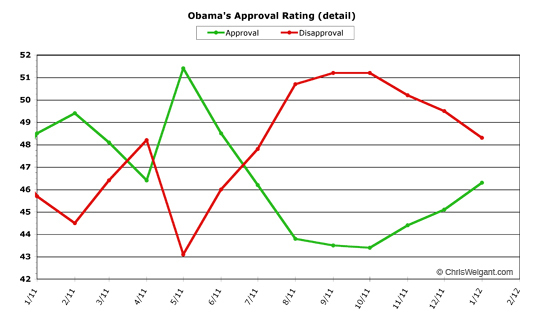 For the month, Obama charted an average of 48.3 percent disapproval. Both of these numbers were 1.2 percent better than December's numbers. 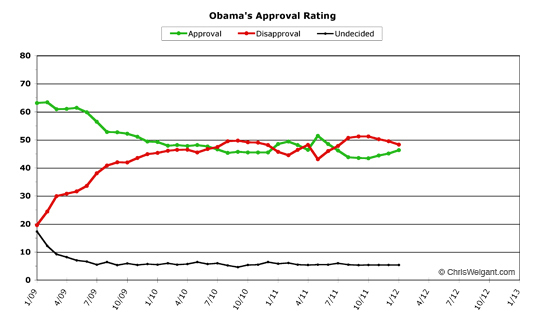 The trend for Obama continues to be good, if a bit "slow and steady." January was the third straight month Obama's approval numbers rose -- the longest such stretch he's ever posted. Obama has previously had his approval numbers go up at a faster rate, though (even discounting the "Osama Bin Laden bounce" of 5.0 points in a single month, last May), and he did have an almost-equivalent period exactly one year ago, when he posted two months of gains after two months of zero change in approval. During this time (from November, 2010 to February, 2011) his approval number fell for five solid months, so Obama's three-month stretch of lower disapproval still has a ways to go to set a record. Speaking of records, Obama once again did not post any "all time" records in either daily averages or monthly averages, for both approval and disapproval numbers -- another good sign. Obama enters February riding a mini-bump in the polls after his State Of The Union address. Rasmussen, which runs a daily poll, had Obama at 51 percent approval entering February -- the highest he's posted for quite a while. Even just taking the daily average, Obama's already doing better than his January monthly average -- a sign his numbers are improving. The question is whether this bump will fall back again or not. There are really two big events scheduled this month which will likely affect Obama's poll numbers -- the release this Friday of the January unemployment number, and the rematch of the payroll tax holiday extension fight in Congress. If Friday's unemployment number is better than last month's, it will help the overall mood of the country, and help Obama as well. If Congress manages to pass an extension of the payroll tax cut for the rest of the year -- as virtually everyone expects them to do -- Obama may also see a benefit in the poll numbers as well. February will be a relatively quiet month for the Republican nomination race, but the effect of this on the public is anyone's guess, really. Again, discounting the Bin Laden bounce, President Obama has gained back all the ground he had lost since July (or April, if you ignore the Bin Laden spike in May and June). But while this is indeed good news, Obama's numbers are still lower than he needs them to be to get comfortably re-elected this fall. February may see -- if Obama's positive trend continues -- the approval and disapproval lines cross over once again, putting the president "above water" for the first time since last summer. This would be an enormous milestone for his campaign efforts. The rule of thumb is that re-election gets a whole lot more certain if you're polling above 50 percent, though -- a milestone which is still pretty far away from Obama's current numbers, even with the positive trend of the past few months. So while the overall trend is indeed extremely positive for Obama at this point, he's still got a long way to go to retain his job this fall. In other words, another month of slight improvement, both on the approval and disapproval side. R's heads are exploding. newter and mittens are tearing new ... and Obama keeps on keeping on. To quote the King of the second Country in Asia to declare war on the US: 'Tis a puzzlement. summers have not been kind to this president. it looks like his numbers have tanked every june, july and august he's been in office. More good news for Obama: good employment numbers. yes, winters seem to treat him much better, except perhaps the winter of '09-'10. and even then his numbers slowed their decline from that summer. any theories on why the numbers have played out like that?